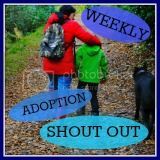 Last week we had another good week on The Weekly Adoption Shout Out. It’s great to see new bloggers joining in, some from different parts of the world, adopters and adoptees. We always wanted WASO to be for all those in adoption, to give a broad spectrum of views and experiences. We hope you are all enjoying reading all the different posts, we definitely do. This week’s theme is “Transition”, which we think can be interpreted in many different ways in the world of adoption. I’m sure you will no doubt enlighten us with your own slant on this topic. It is, as always, optional. Writing to a theme is not for everyone or other things may be happening that you need to blog about instead and that is fine, everyone is welcome to join in with their posts. Also we now have a Facebook page, where we are sharing your posts and other WASO snippets so please hop over and LIKE us and join in. Surviving fifteen years of Adoption . Would a sibling suit our family? Transitions - daily, hourly etc. Grey Street - Stop. Transition Time. I lately came across your website and have absolutely been reading along. I would like to study much more of your respective blogs and to share my feelings with you.